The farmhouse aesthetic is all the rage. 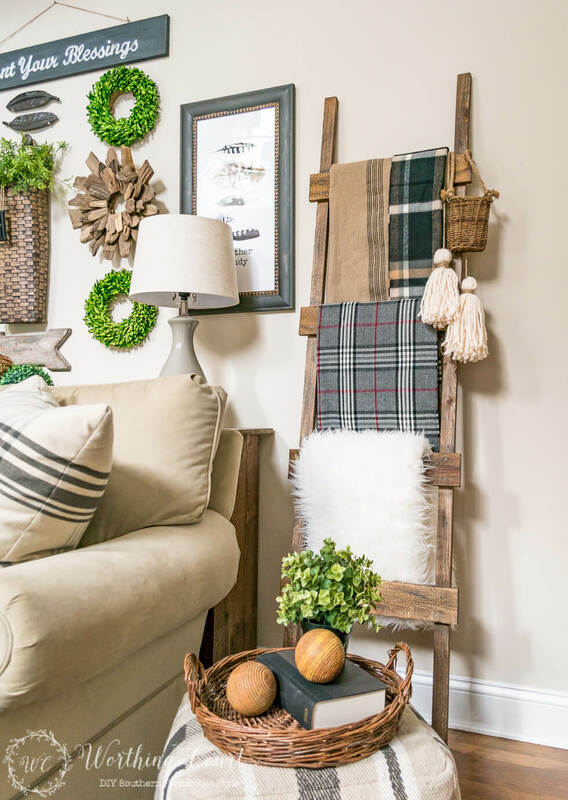 Primitive antiques have been climbing in price for years, but you don’t need a huge budget or a professional interior decorator to pull off the newest and best farmhouse furniture and decor ideas. If you’re looking for some fresh, editorial inspiration for your next design project, then we’ve got you covered with 57 gorgeous looks for every space in your home. 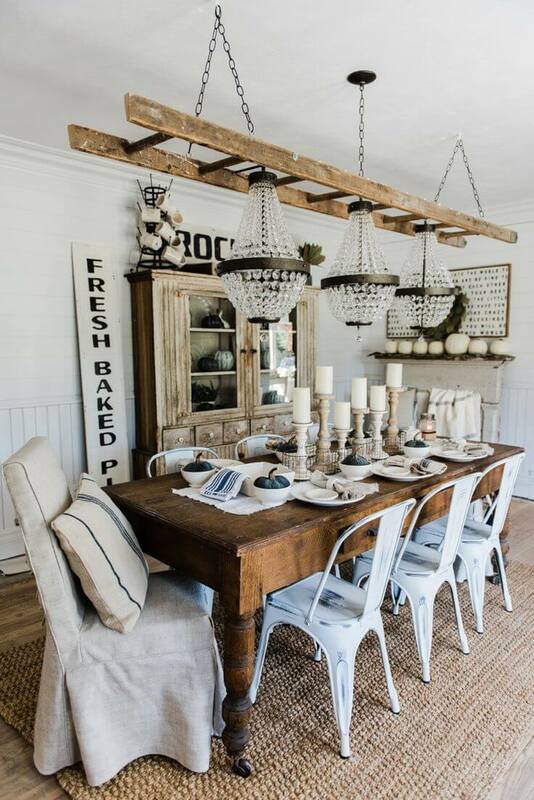 If you love the country look, then a rustic farmhouse table is a given. We’ll show you how to use one in the dining room, the living room, and even the hallway. But farmhouse tables barely scratch the surface of this warm, lived-in style. Pair yours with classic black lanterns or galvanized steel hanging lamps that also introduce a bit of industrial design. 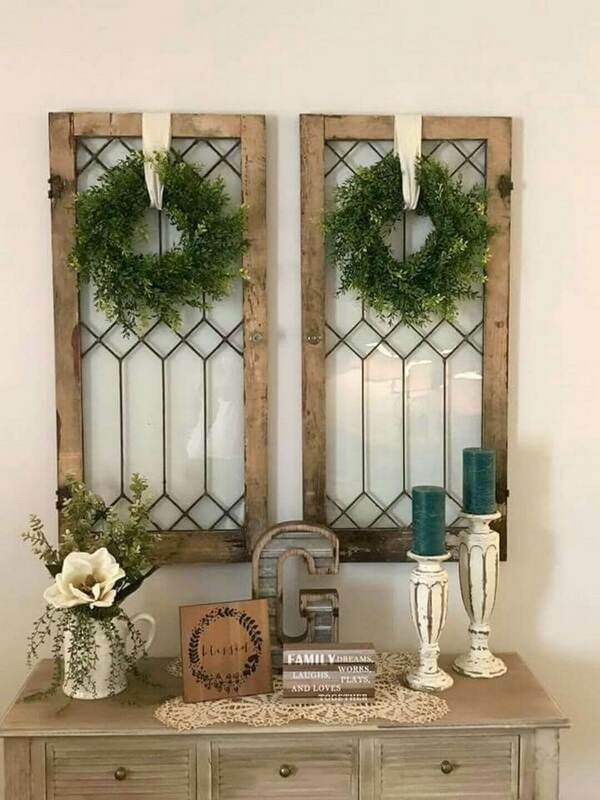 Whether you want to dedicate one free corner to farmhouse furniture and decor ideas or you want to fill your whole house with fabulous farm fresh finds, we’ve got your ready-made inspiration board below. From seating, surfaces, and lighting to flooring, architectural features, and smaller accents, we’ve gathered all of this season’s best country-inspired standouts in one convenient list. 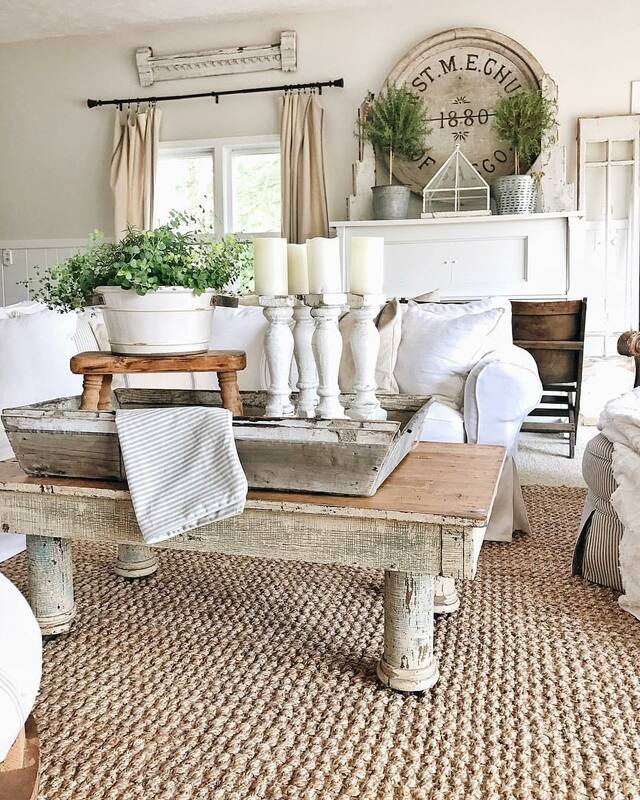 This neutral farmhouse living room is a rustic decor dream. 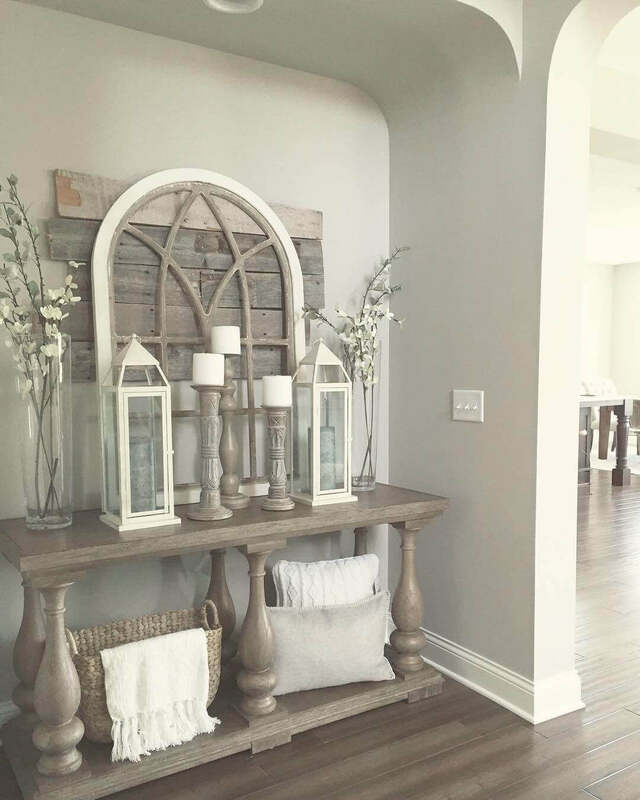 From the gorgeous beige on the walls to the distressed white paint on the balusters and wooden wall accents, there is a simply unaffected look here. 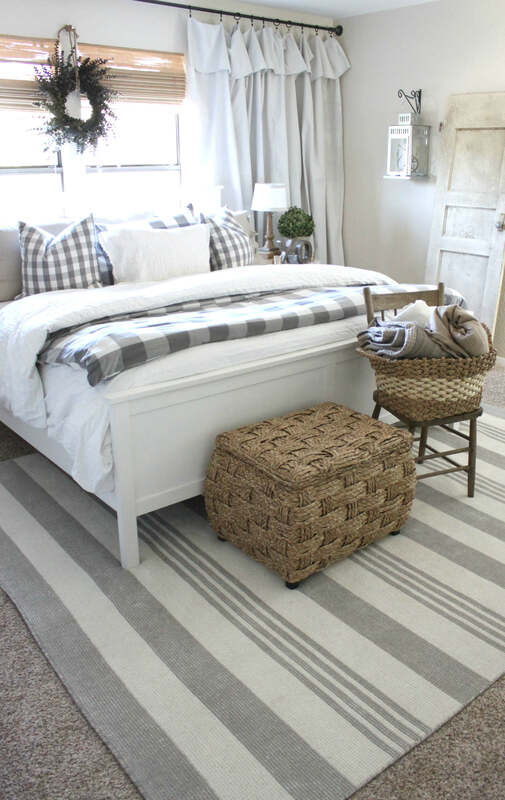 It’s casual and picturesque but pulled together with the jute rug and striped fabrics. This is such a great idea for a small, bare corner without being overdone. 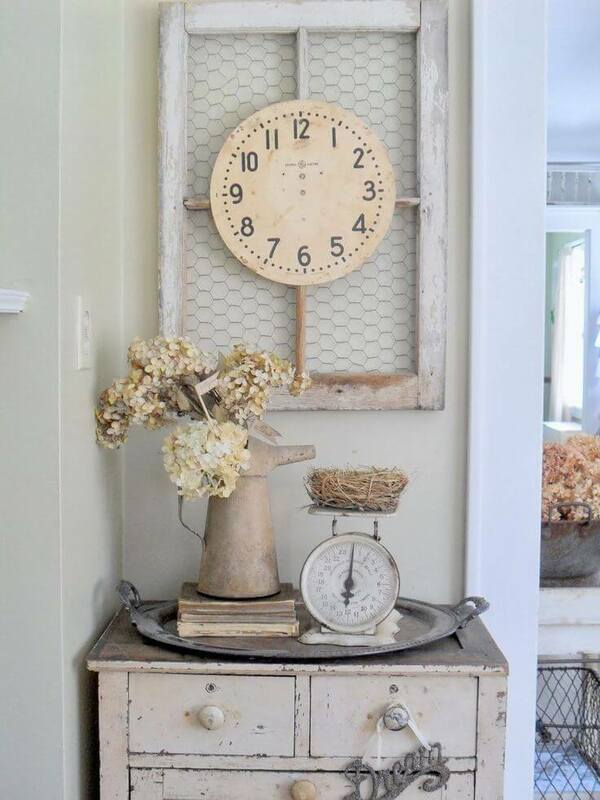 The chicken wire in the window pane and the watering bring a little piece of the outside indoors while the scale and clock balance each other for a general store feel. 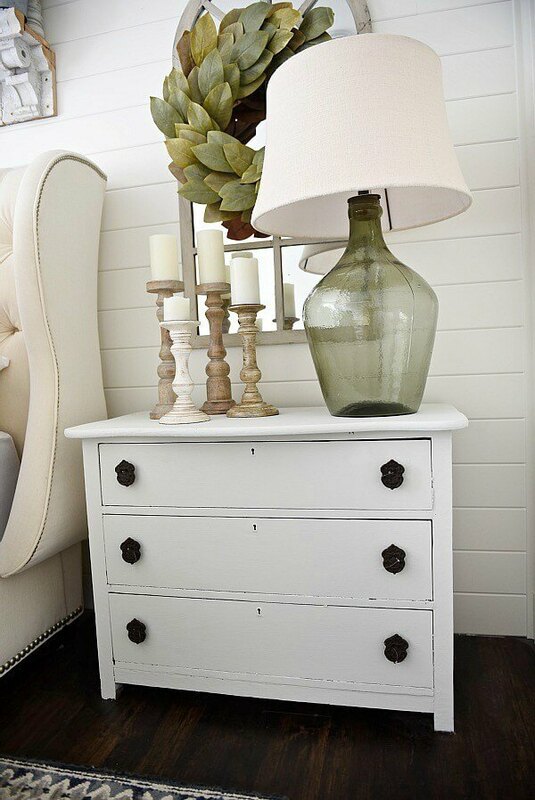 The small dresser can be storage for linens and extra place settings. 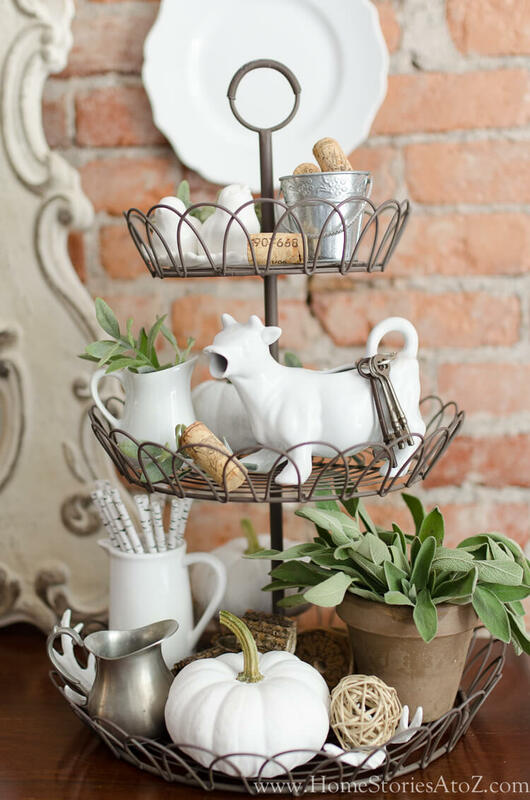 Pallet wood, cotton stalks, and pewter accessories are combined here for the quintessential country charm look. 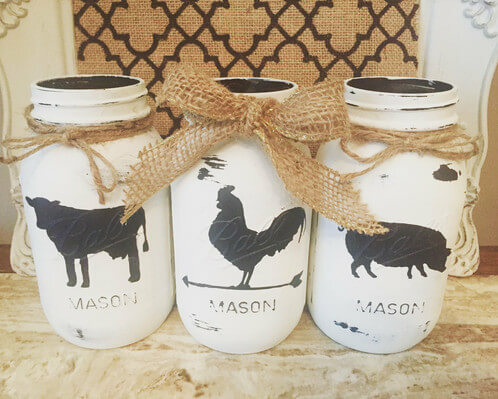 Farmhouse decor is often centered around a handful of elements that are similar in material but different in purpose. Using a watering pot for a vase gives it new life, and the wood pallet behind it balances this tablescape. This entryway is wide and bright with beautiful wooden floors and a window-like mirror that creates the illusion of more space. Both a southern and more global way to say hello send a welcome message, and topiaries bring in a bit of green life and differing heights. The globe and pillow give a travel feel that welcome new guests and wish buen viaje to those leaving the home. Balancing industrial and farmhouse looks is very popular, and this composed dining room does not disappoint. The wooden table, iron chandelier, metal chairs, and wicker captain’s chairs work beautifully together with the fresh florals in the centerpiece. White flowing curtains and a large, chunky clock finish off the blended look handsomely. This whimsical tiered tower gives height to any surface – dining table, kitchen island, or entryway console table. Lively green plants and painted pumpkins pair well with tin and stainless steel. Rustic metal and smooth porcelain create a great juxtaposition with the red brick wall behind. The ring at the top also provides portability so it can be used wherever it’s needed. 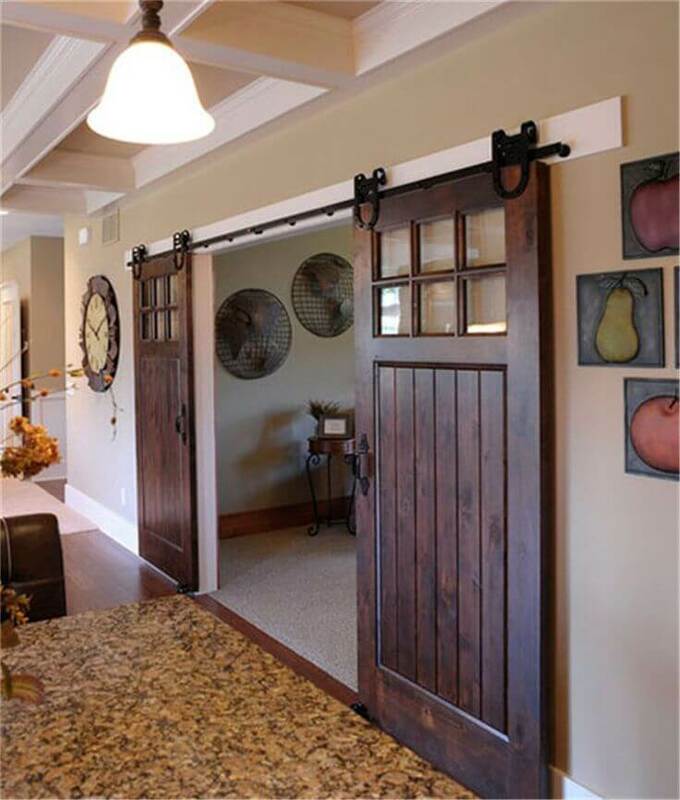 Sliding barn doors provide access and privacy both in areas where swinging doors would be bulky or unnecessary. 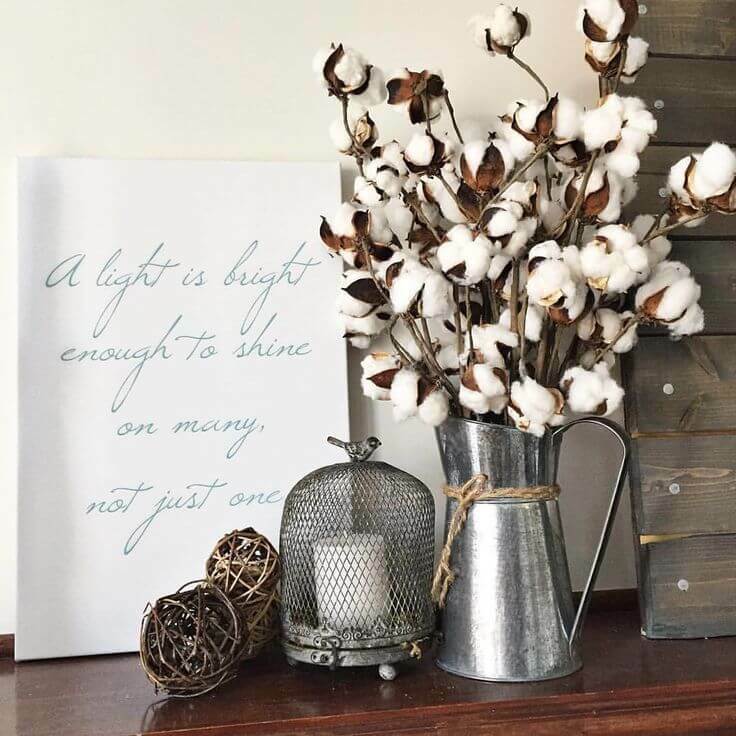 They are also a big hit in industrial and farmhouse décor. 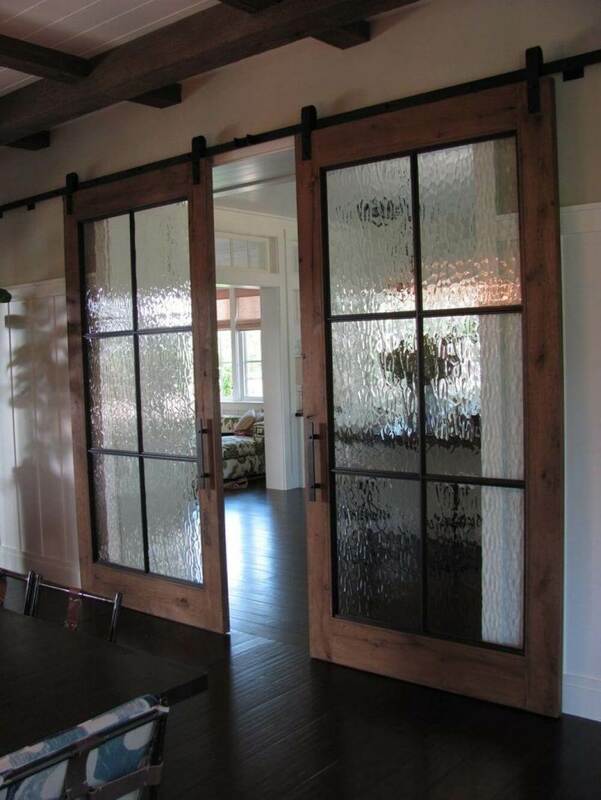 These doors fit the bill for both with stained wood trim and iron accents. The dappled glass provides a little extra privacy while still letting natural light through to the room. 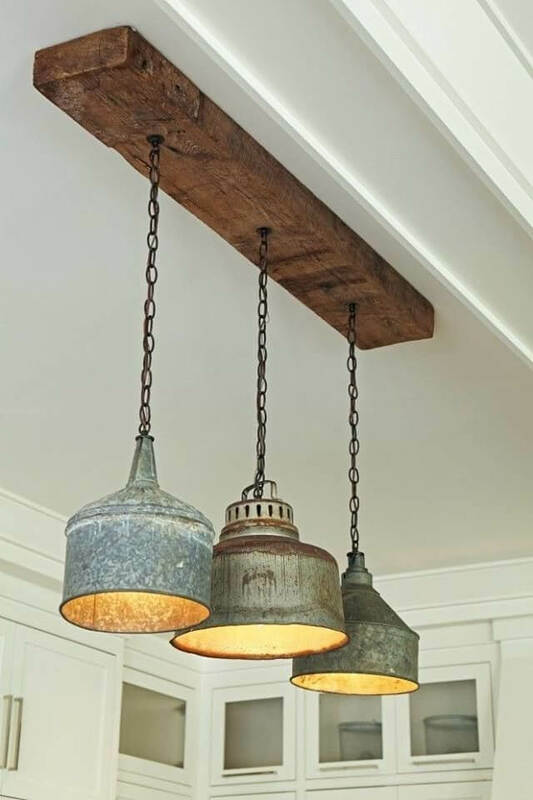 Mismatched galvanized steel pendant lights mounted on reclaimed wood make a great pair in this kitchen fixture. In an otherwise clean, white space, this fixture creates a bit of whimsy and nostalgia for when things weren’t always perfectly matched. The chain could also easily be shortened or lowered depending upon where it’s hung. Using window panes for mantel and wall decorations is a staple in farmhouse décor. 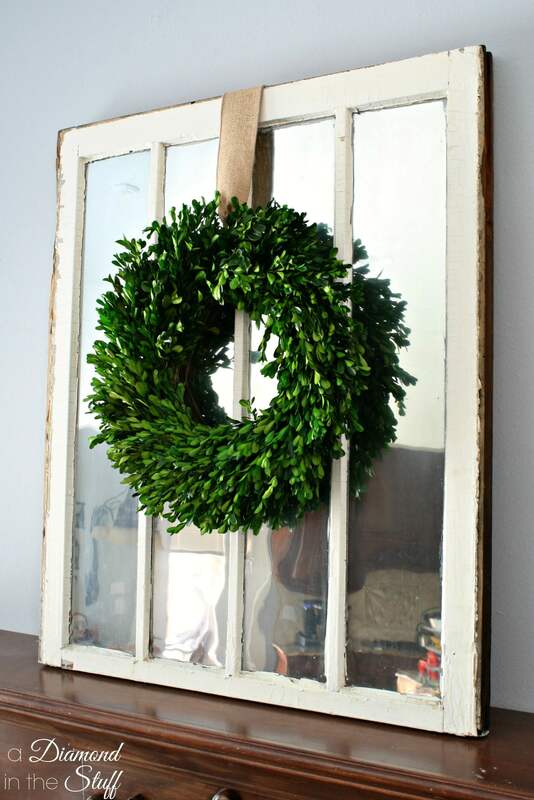 They can be used for room dividers and picture frames, but here, it’s used to display a green leafy wreath. That mixed with the stark contrast between the distressed white frame and dark wood mantel creates a visually striking combination. Looking for a fresh way to create light in dark spaces? Try these lantern votives that can be suspended from a ceiling or hung on sconces as they are here. Use LED candles for a child-friendly option, or light votive candles for a sweet, romantic glow in a dining room during a romantic dinner. 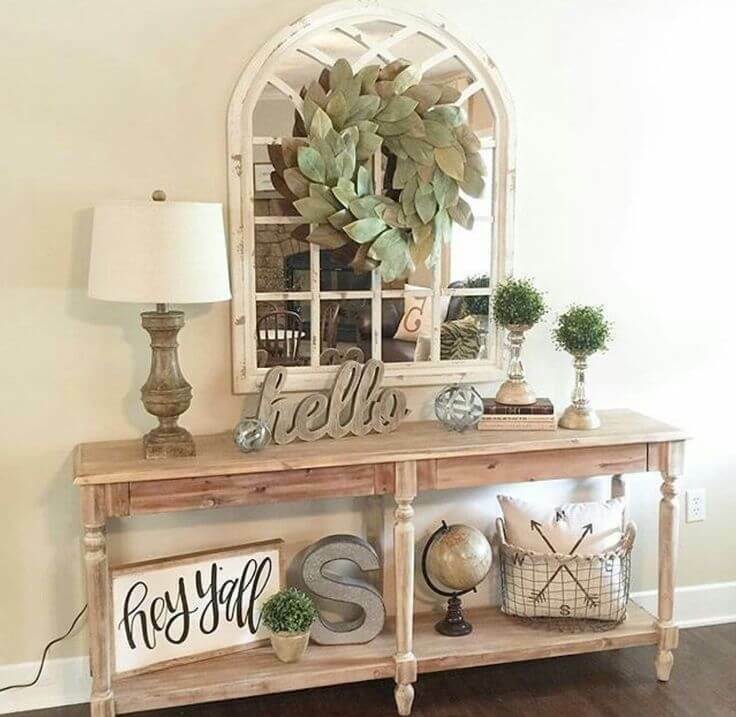 These antique windows lend themselves to a great entryway piece. They create a welcoming feeling from the live wreaths to the transparency of the glass. Throw in a few baluster candlesticks, inspirational plaques and a monogram or initial, and it’s a perfect combination. Fresh flowers and lace doilies add a homey touch. Imagine this two-tone farmhouse table loaded down with holiday favorites! Don’t be afraid to mix stains; the dark wood on the table top and benches contrasts nicely with the grey finish on the floors. Another window on the wall with a wreath and a lantern pendant finish out this dining room perfectly. This utensil holder on the counter is reminiscent of a grandmother’s counter. Whisks and rolling pins tell a story of days gone by, and the fresh flowers and modern countertop bring you back to the present. Distressed brick on the backsplash ties it all together with the similar paint color on the cabinets. Curling up with a good book in this corner would be a perfect afternoon. A cozy chair, a soft pillow, and a warm throw are an unmatched recipe for comfort. A distressed table to hold a mug of coffee, and an outlet for a space heater or fan adds to this relaxing spot. The natural light coming through the window can be adjusted with the printed duck cloth curtains. 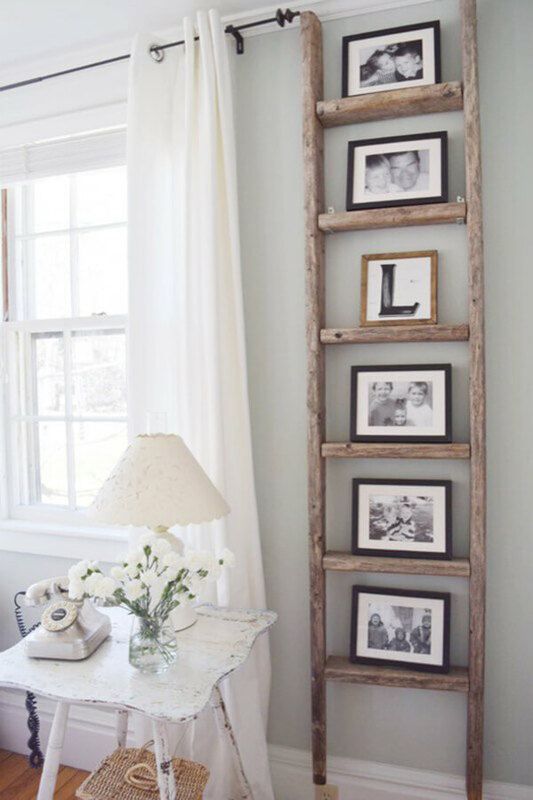 Displaying family photos in a unique way is right at the heart of what a farmhouse should feel like. 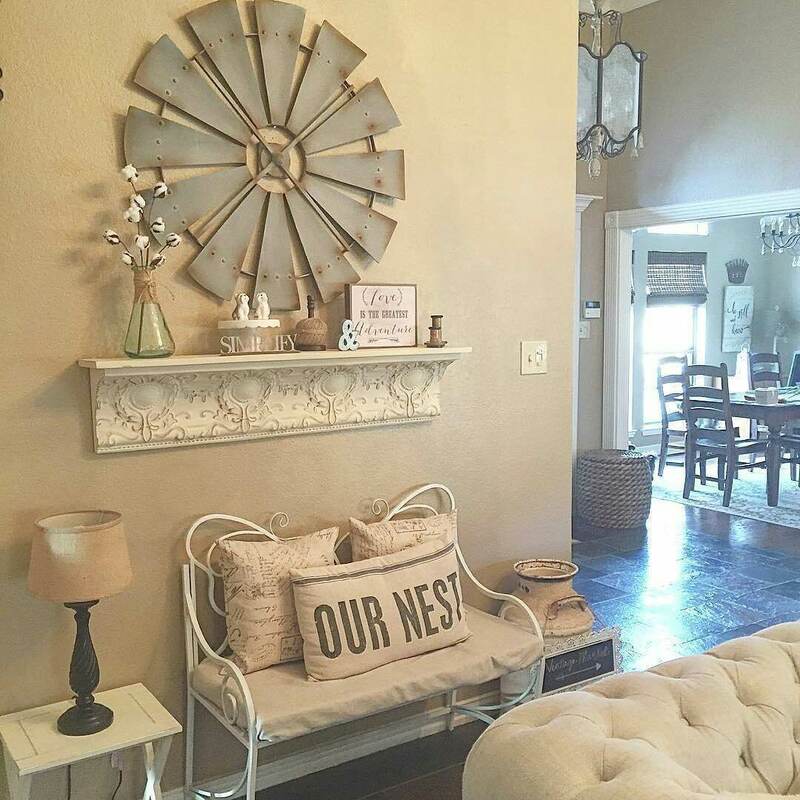 This antique ladder with a photo on each rung is perfect for a living room wall. 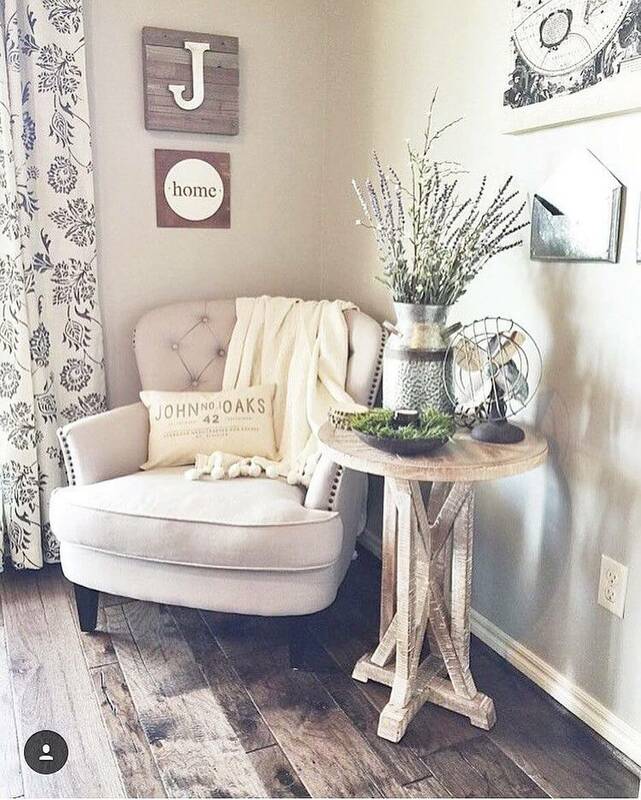 Add a distressed accent table with fresh flowers and a unique phone, add a basket for a bit of storage, and you have the perfect corner of a room to show off all those amazing photos. 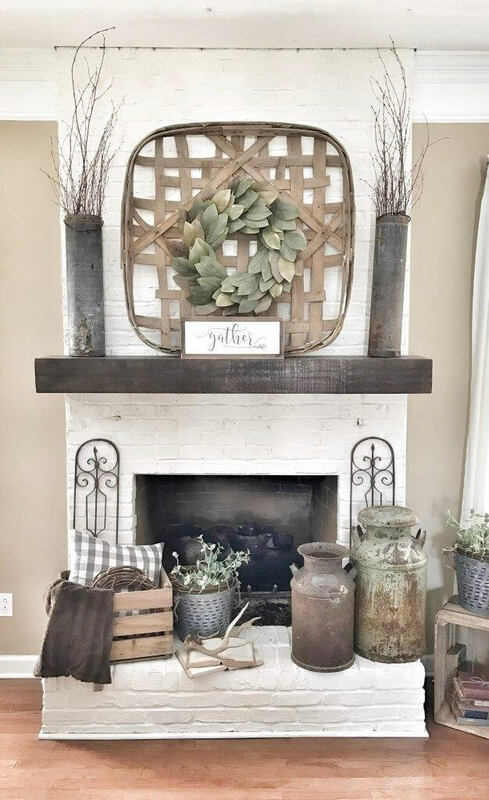 Wood-burning fireplaces with rustic mantels just shout rustic chic. There’s symmetry here with the iron scrolls on either side of the hearth and the vases up top, but it’s broken up for a more casual feel with the milk jugs and storage crate. The antlers and magnolia leaves in the wreath give a nice winter-time touch. Mason jars are great for making instant vanilla pudding or butter from scratch. They’re also great storage for dry ingredients, but here they’re used for decorative purposes. They serve as art just as well as they serve as storage. Cow, chicken, and pig stencils add a country flair. When you have a large piece like this windmill, it can make a very bold statement. This piece is balanced well with softer elements like the throw pillows and cotton stalks. This is a perfect place to sit and tie shoes for little kids or provide extra seating when the guest list exceeds the living room! A lamp and milk jug frame out this space perfectly. 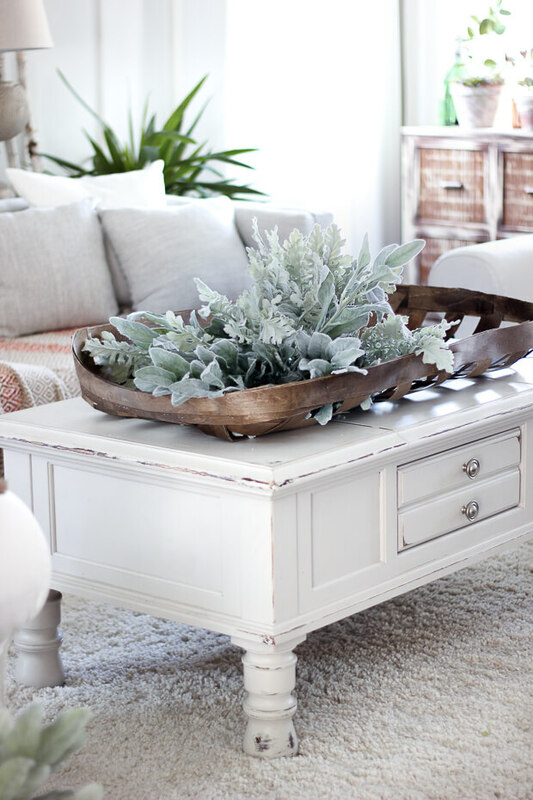 The tobacco basket on this distressed coffee table makes a perfect place to bring in fresh and living elements. The stark white rug and table are a great foil to the bright green wintery plants lying on top. The rug is plush and gives you a feeling of luxury, and the deep couch and chairs let you settle in for a relaxing afternoon with a book or with friends. This white farmhouse sink is a seamless pairing with the old-fashioned water pump faucet. The watering can doubles as a vase and adds to the rustic charm. The storage cubby on the wall and the ceiling light fixture gives you a schoolhouse feel, while the sconces on the wall frame the mirror to give an industrial twist to the room. Don’t have any linen closet space? 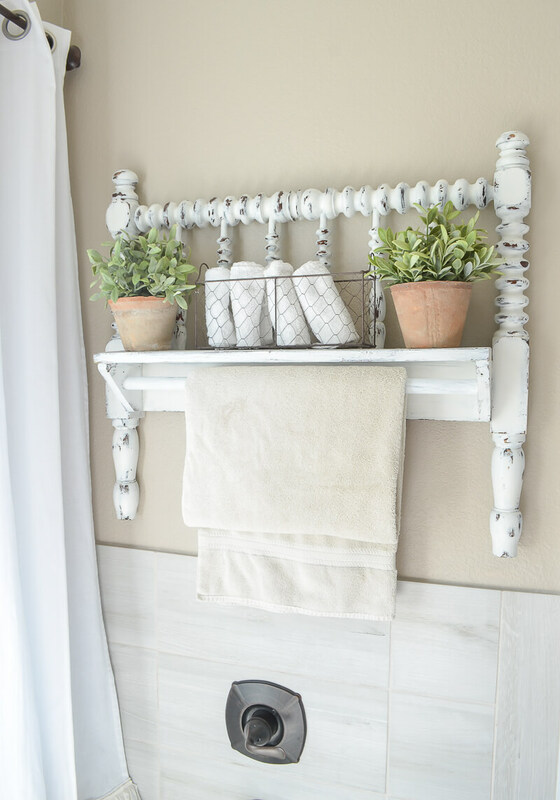 Need a fresh, new way to display and store towels and washcloths? Thrift stores are full of wooden bed frames of all sizes; just paint and distress the footboard, (it’s shorter and will take up less wall space) and add a small shelf and rod. Find some pretty greenery to freshen up the piece: instant linen shelf. And, it’s pretty! 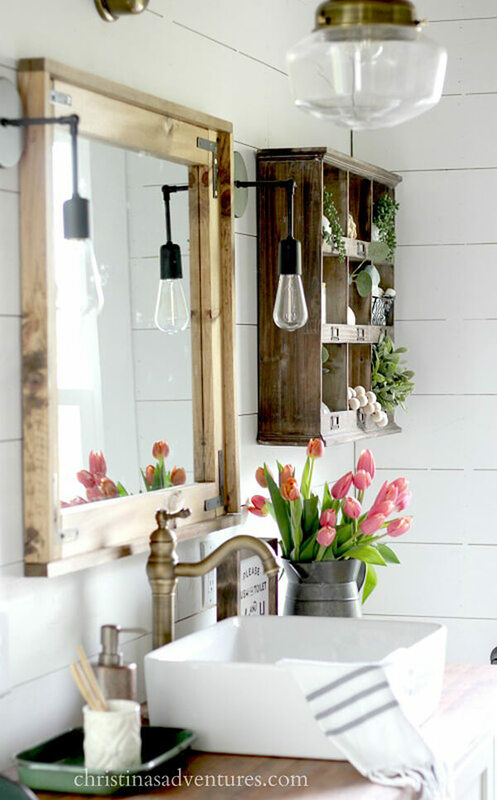 How amazing is shiplap? It gives both rustic charm and clean lines, and it pairs so nicely with all types of wall art and furniture. Canvases here mixed with wooden and metal hooks go nicely with the antique bench and glass milk jug. 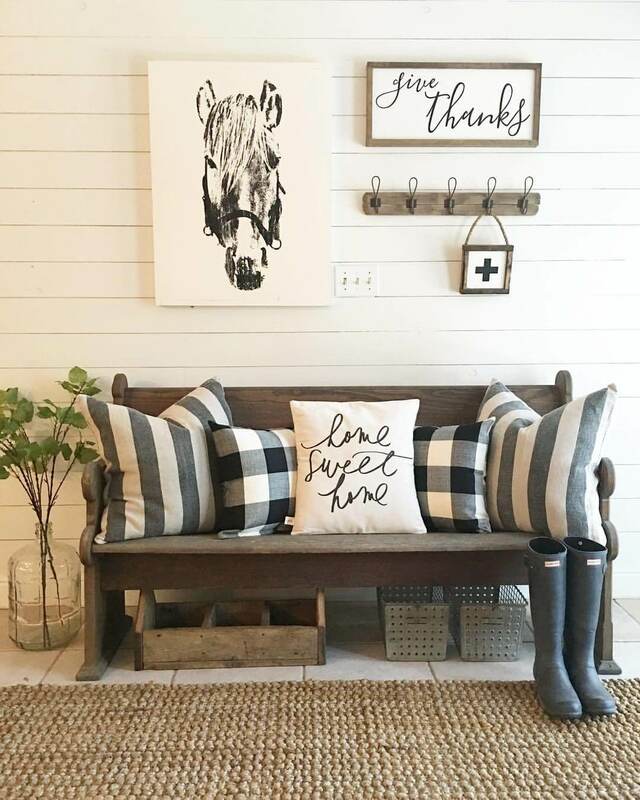 Soften the space with some monochromatic throw pillows, and add storage underneath for a perfect mudroom space. Magnolia leaf wreaths are a farmhouse necessity to bring southern charm into any environment. 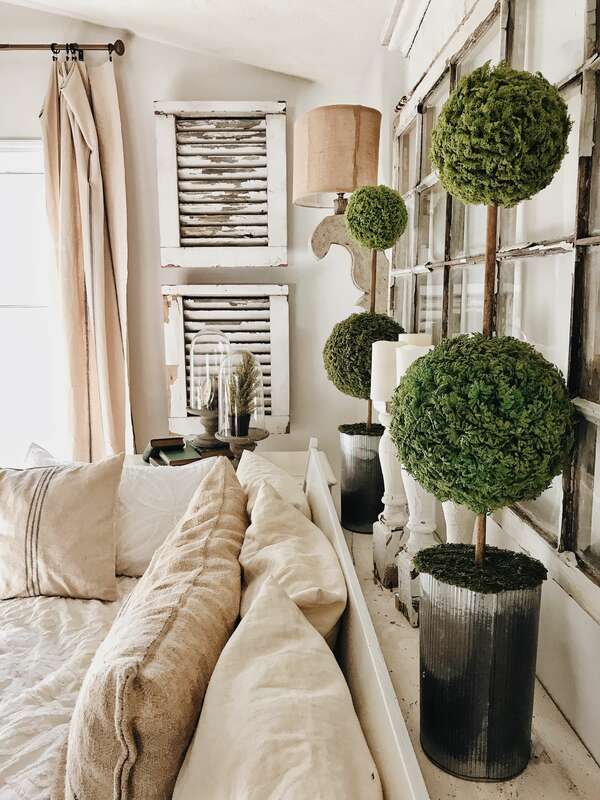 A green glass lamp pulls the color from the wreath, and the short, distressed dresser gives great storage beside a luxurious white wingback headboard. The corbels above the bed with a shelf add storage and pair well with the mismatched candlesticks. Most living rooms have televisions, but working one into a room without it being obtrusive can be difficult. This television is flanked by charming glass jars doubling as vases, and it sits on a white credenza with wooden doors that mimic barn sliders. It is a great way to display a television without it being the center of the room. Most floor plans don’t have a pantry like this one. This space could easily be built between the studs. Shelving board and containers provide storage at whatever heights you need, and using an antique sliding barn door gives the impression that the pantry was always there. 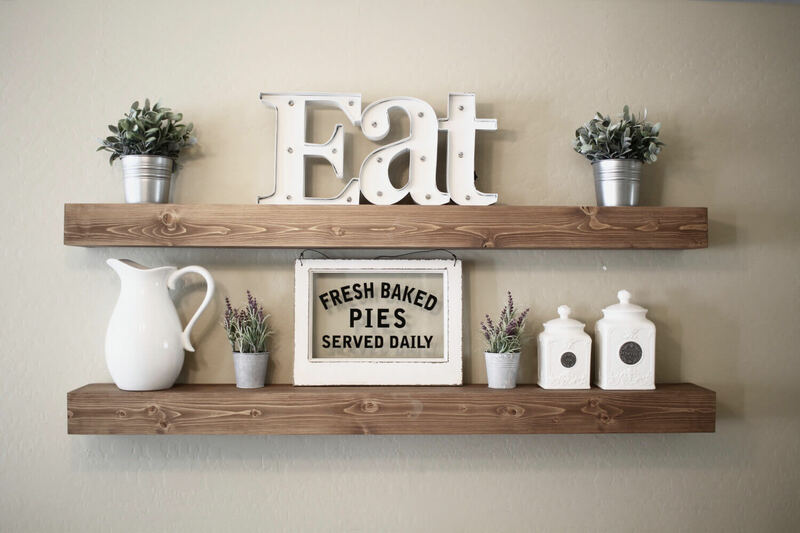 Add a rustic sign above the opening to finish the look. A ladder isn’t just for displaying pictures. They can be useful for storing blankets in a cute way. Lean an antique version against a wall with other wooden and green accents, drape throws across each rung, and use coordinating fabrics on the furniture to tie everything together. Vases can be so boring. Using things that normally don’t serve that purpose can give life to an otherwise boring tablescape. Tie six slim glass bottles together in a pyramid pattern with jute twine and fill them with water. Drop in slim stems of flowers of varying colors and mix with green pieces. Instant centerpiece. 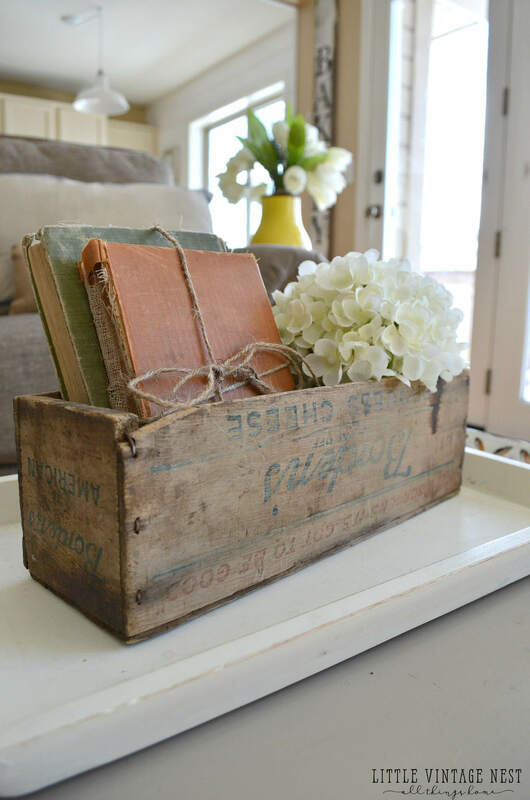 Antique wooden crates make the best storage containers. This cheese box holds old books tied together with twine. 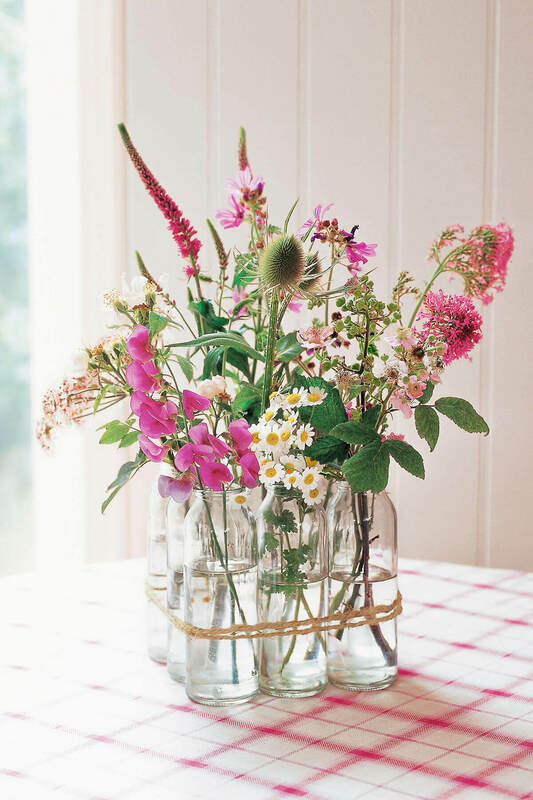 When you add a small handful of fresh flowers, it gives the piece a homey look. It’s a great centerpiece for a coffee table like it’s displayed here, but it could work for an end table or console table in an entryway. Stairwell walls are usually massive blank spaces. Break that huge wall up by adding vintage items. The washboard and frames without glass work well with the shadowboxes and windowpane. Mixing shapes and colors break up the monotony of a large space. Signs with inspirational messages give a pick-me-up going up or down the stairs. Here is another example of utilizing a ladder for decorative purposes. This one is repurposed as a light fixture. The wood matches the farmhouse table while the glass elevates the look without being too stuffy. Using a tall metal sign on the wall mirrors the length of the ladder on the wall for a well-thought-out look. When eating areas are small, maximizing space is a must. 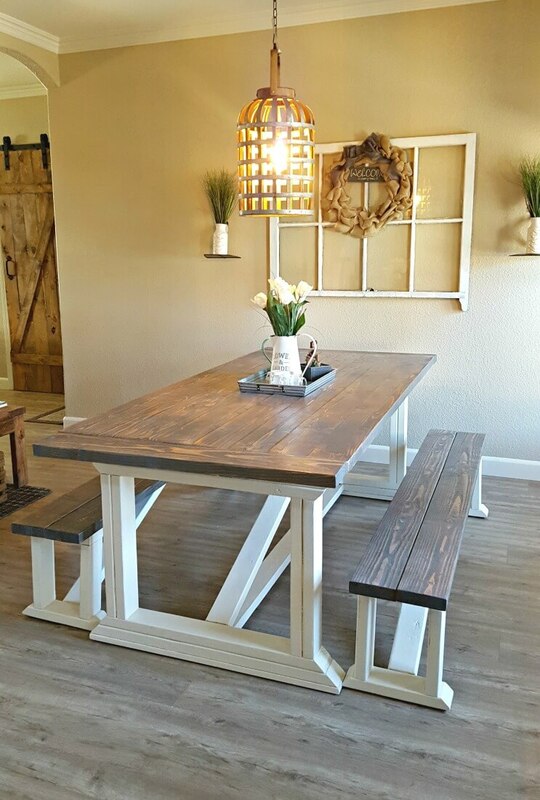 A farmhouse table with a bench that can slide underneath gives extra seating but can hide when it’s not needed. Use an ornate light fixture to make the space seem bigger without taking up any floor or wall space. Lay a rug to delineate the space, and it will pull the look together. Man, oh man, is this a gorgeous reading nook?! 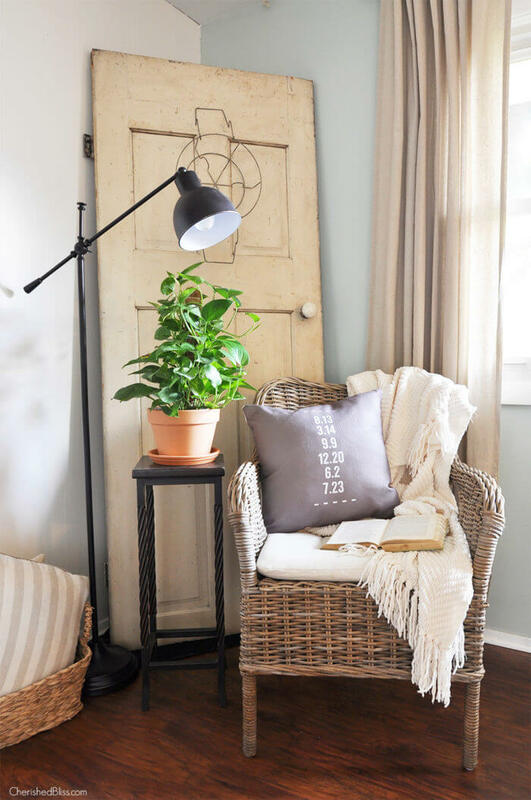 It has all the right pieces: a comfy chair, a pillow and blanket, natural light for daytime reading and a lamp for evenings. There’s even a plant for bringing life into the space. Floor to ceiling window panels create height, and the door propped against the wall brings the farmhouse charm. 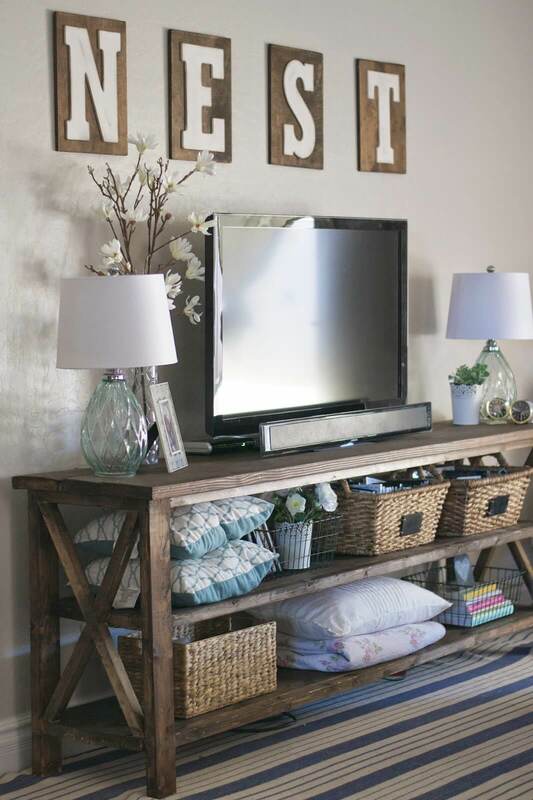 This is another great example of how to display a television without making it a focal point. A rustic, chunky table with open shelving provides storage that is both useful and pretty. Glass lamps sit at either end to provide light in the evenings, and rustic letters above the television draw the eye up when the television isn’t in use. 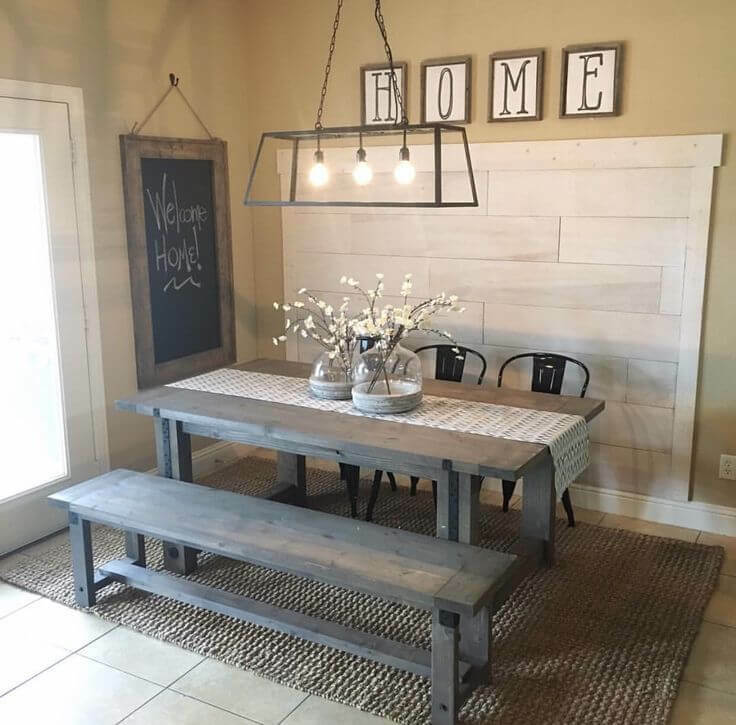 This farmhouse table is stained a gorgeous grey color. The chalkboard sign on the wall can serve as a message board or a menu for a dinner party. 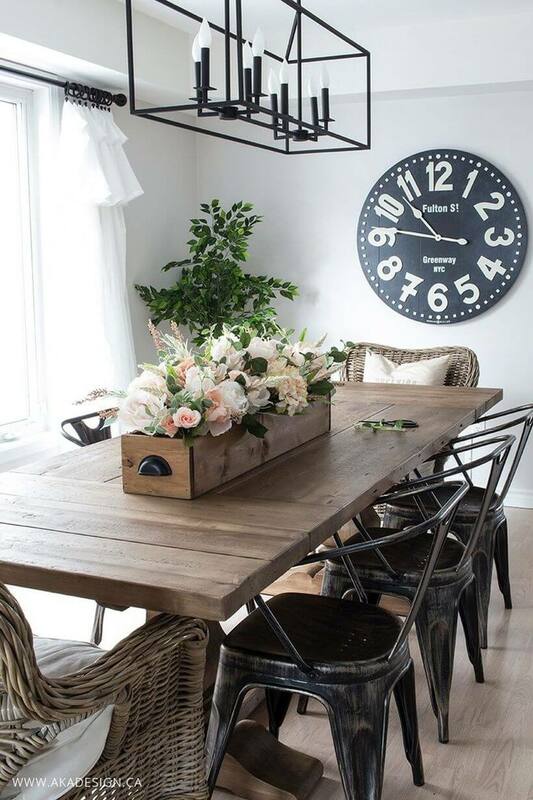 The light fixture and the metal chairs pair well to pull a little industrial into the rustic look in the framed-out wood panels on the wall behind the table. 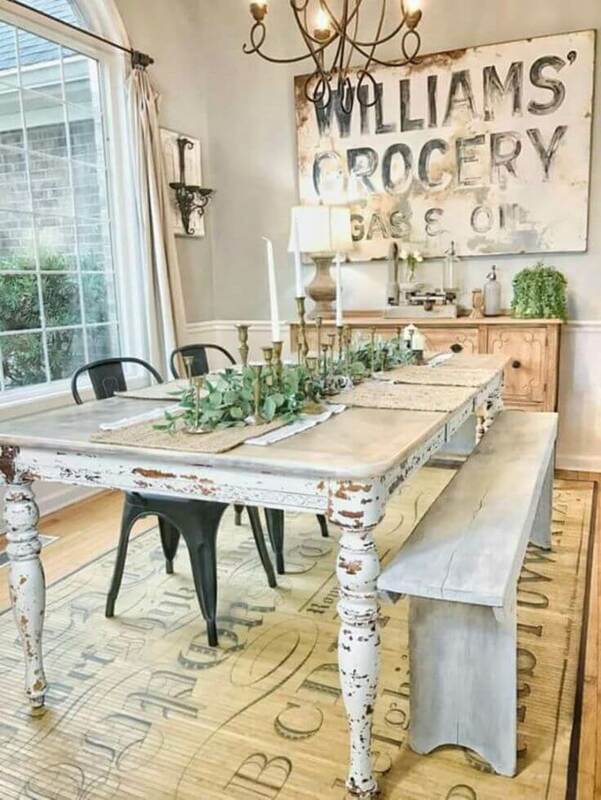 This table must be the most distressed and most beautiful example of farmhouse rustic. It’s got to have the best stories. The rustic nature mixes perfectly with the large hand-painted sign on the wall. The faded sign and the distressed table make a great pair. A long bench and metal chairs are a perfect companion for the sideboard. 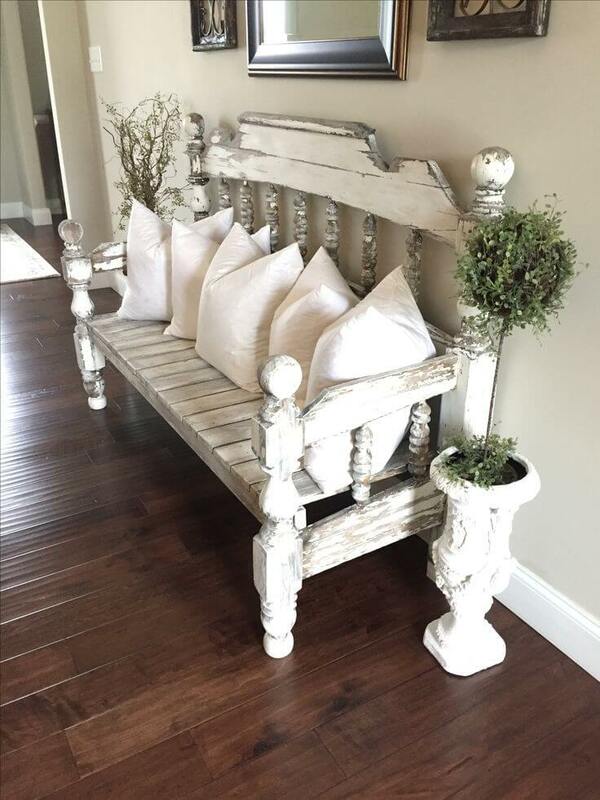 Wide-plank floors and a neutral wall are the best backdrop for a distressed, chunky bench in an entryway. 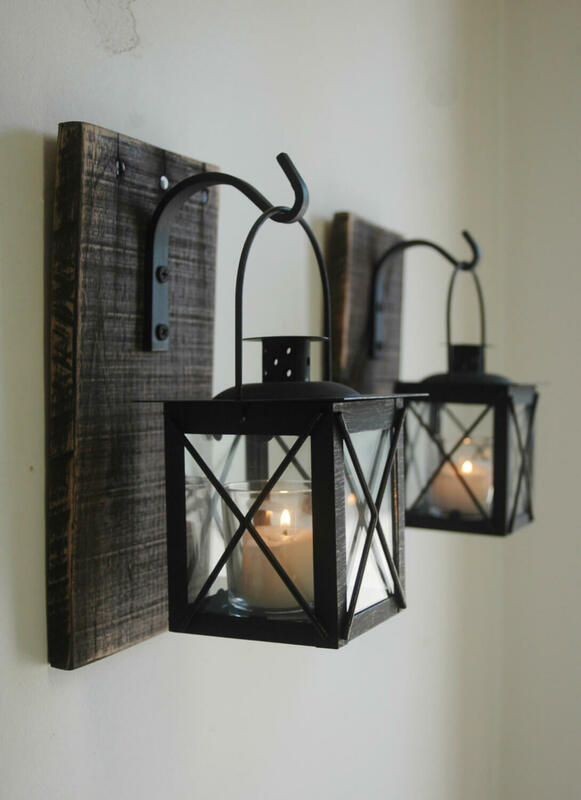 Repurposing old items that seemingly have no further use is a staple in farmhouse décor. This bench was made from a headboard and footboard with slats added to make the seat. Topiaries and other greenery add a nice touch. 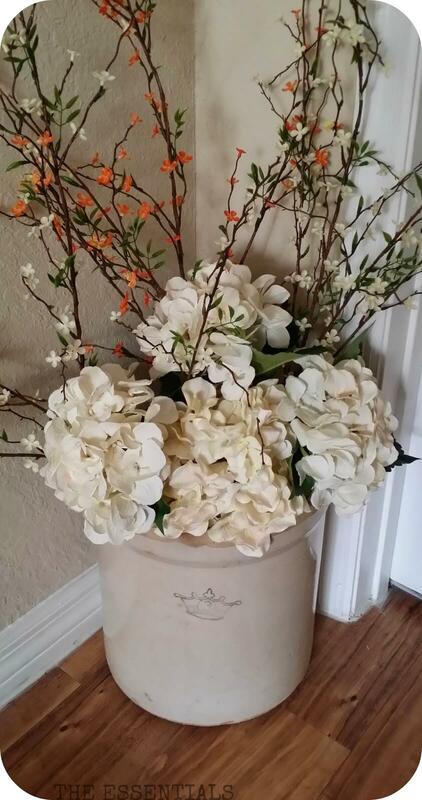 This large stoneware crock that probably held flour or sugar now holds an assortment of flowers for a nice corner-filler. Tall, vine-like plants give height and white petals pushed into green Styrofoam floral blocks fill the space. Check the local craft store for sales on floral stems. Sometimes they’re up to 50% off. This enclosed soaker tub has a sweet little window seat. 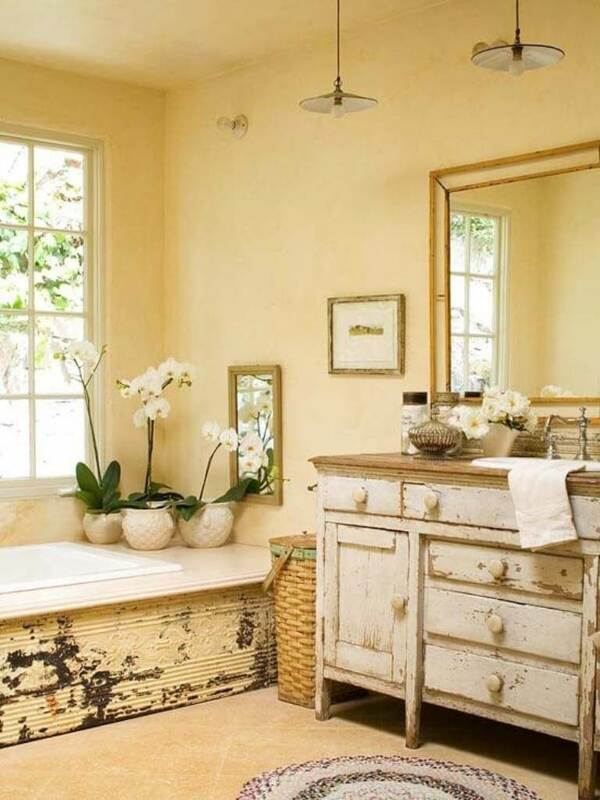 The tin that surrounds the tub is antique and distressed for added punch of farmhouse flair. The wicker hamper adds a nice touch to the old pantry repurposed as a vanity. The sink matches the tub to give an overall feel of rustic chic to this beautiful bath. 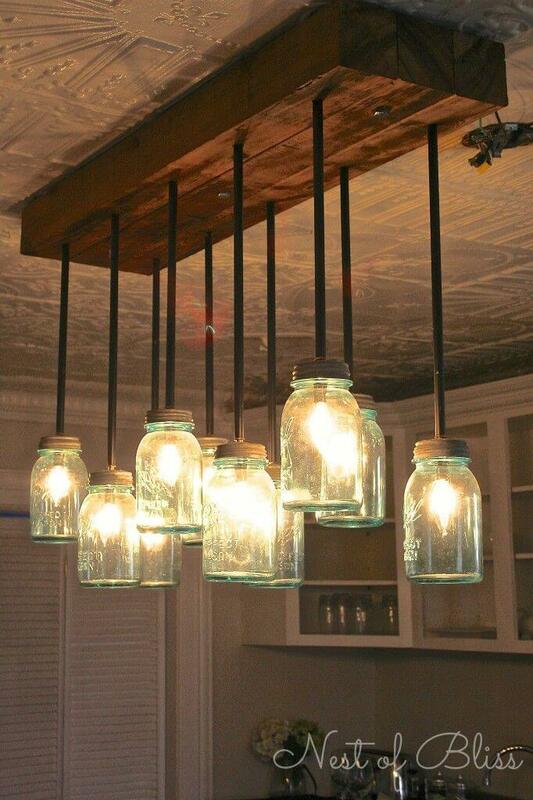 Mason jars at varying heights suspended from a piece of reclaimed wood create the perfect farmhouse light fixture. That ceiling tile also gives dimension and depth to an otherwise undecorated surface. Use Edison bulbs to give a true antique feeling. Grey floors are so beautiful and neutral. They match well with the console table and lend themselves to bringing any color into the design. White and grey pillows and throws add to the monochromatic look, and tall lanterns and baluster candlesticks give height and dimension. 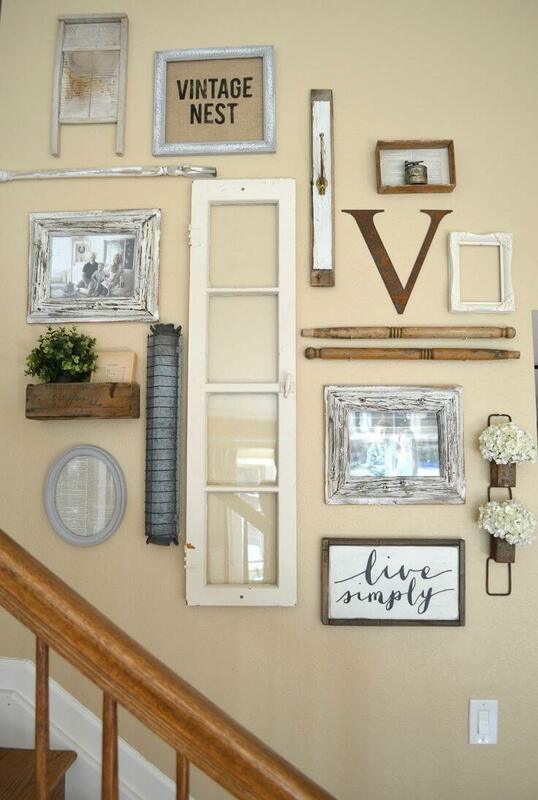 The window pane frames the pallet boards on the wall for a depth that is easy to recreate. 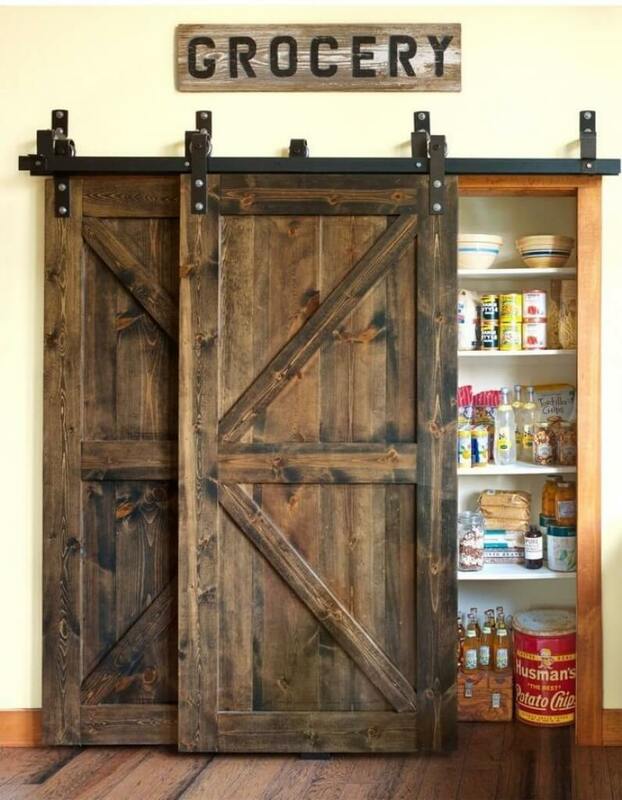 If farmhouse is your goal, but you don’t want to be rustic, try these finished, stained sliding barn doors. They give a country feel without being distressed. Pretty iron hardware creates a finished look with a bit of elegance. Privacy and access come together well in this look. Don’t be afraid to mix patterns! This is a great example of how plaids and stripes can work very well together. Make sure the patterns are the same color or color family so that it’s not an overload! White on the bed, walls, curtains and wall accents give way to the use of patterns in a fun yet classic way. This chalkboard sign is nostalgic and reminds me of the one-room schoolhouse days. The wooden edges and black chalkboard help the white paint pop. 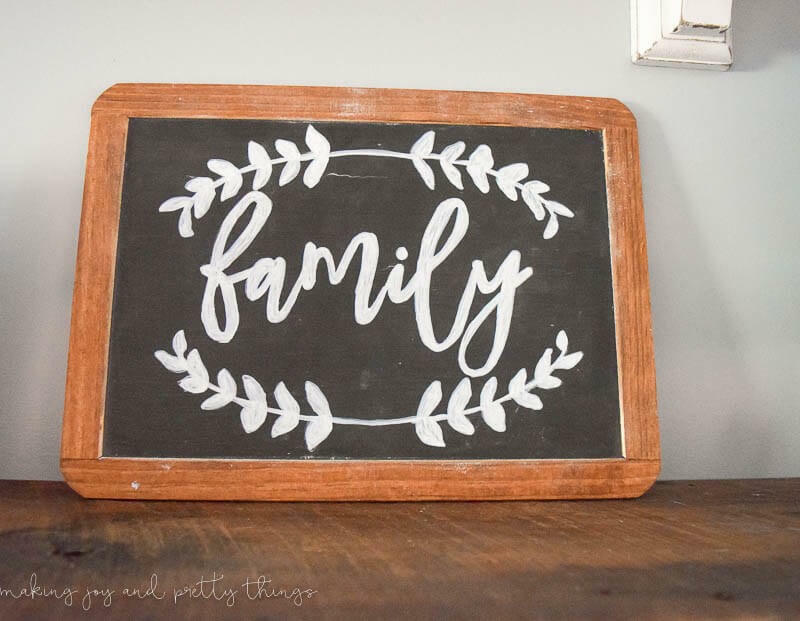 Use real chalk to have a reusable message board in a kitchen or a menu board in the dining room, or use white chalk paint to create a more permanent inspirational message. Counter space is often hard to come by, but giving up a small piece for this pretty combination is worth it! 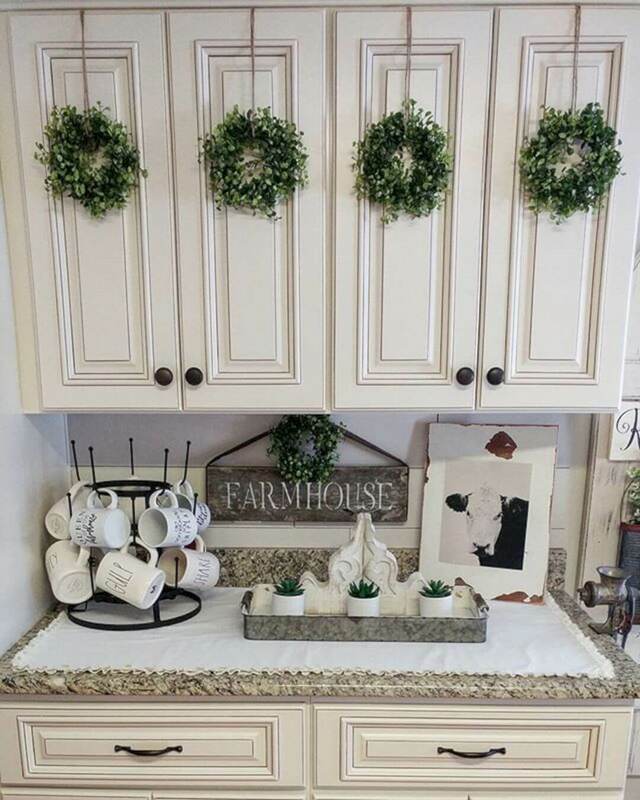 Lively, green wreaths on each upper cabinet door, a matching smaller one at the backsplash with a cute sign, and coffee mugs create a useful and attractive space. The cow is just an added bonus. Concrete is so amazing in kitchens. It’s easy to maintain and clean and adds an industrial feel to a country kitchen. 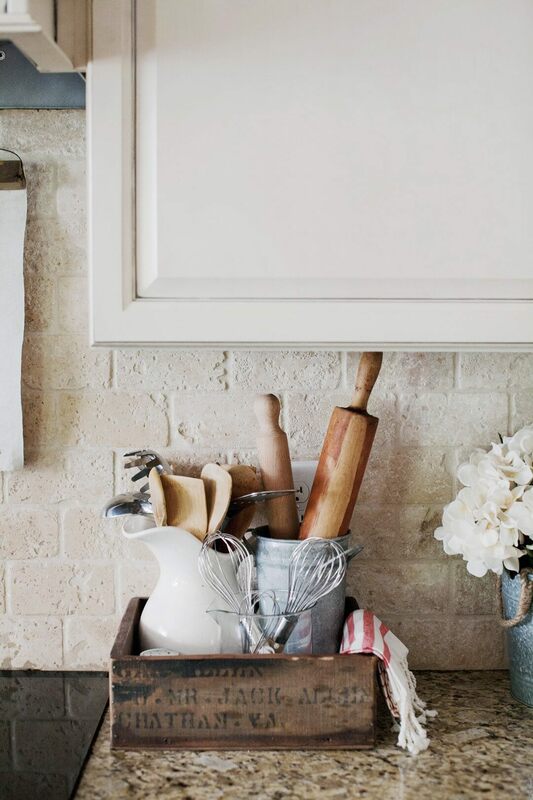 The matching open shelving above the white farmhouse apron sink pulls everything together. White subway tiles with grey grout is a nice touch that puts a little traditional into the design. Add a tiered shelf with knickknacks and the look is finished. This is another innovative example of repurposing old items for new functions. 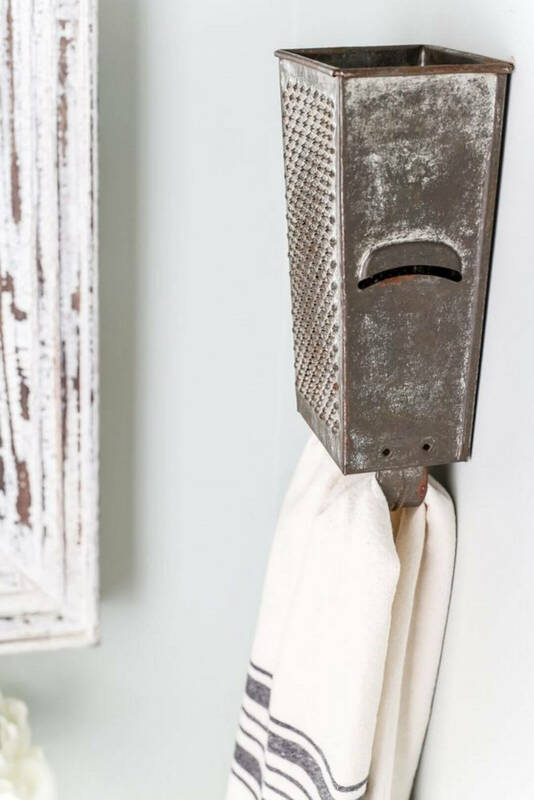 This old galvanized metal box grater hung upside down on the wall is the perfect hook for a kitchen towel or oven mitts. 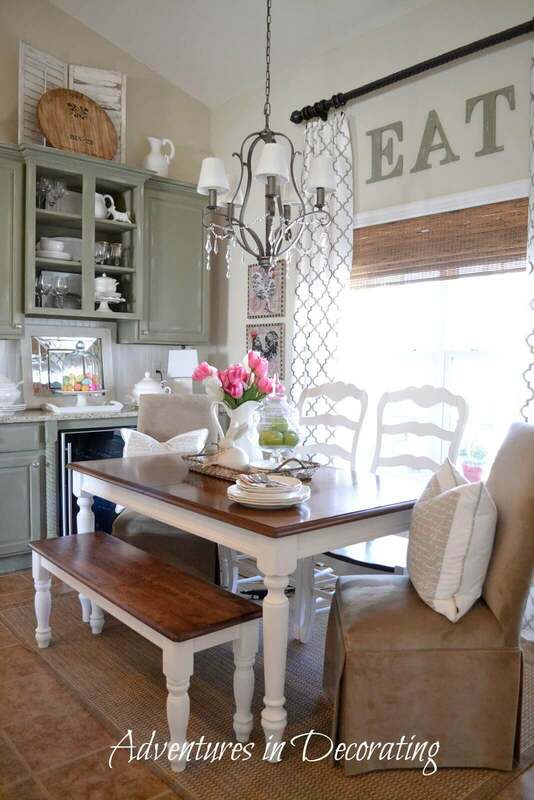 The white distressed wood in the background pulls everything into the farmhouse look. Antique sewing machines are the perfect pieces for end tables or storage in a large bathroom. They bring iron and wood together with pretty scroll work and naturally distressed surfaces. 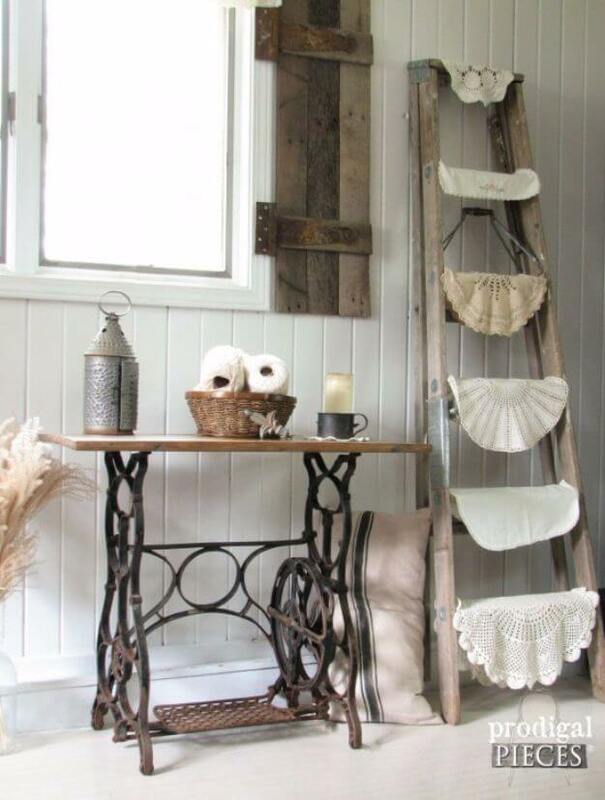 Add reclaimed wood shutters and an antique ladder with lace doilies for a finished look. Open shelving is useful and beautiful in any situation: bathrooms, kitchens, pantries, closets. 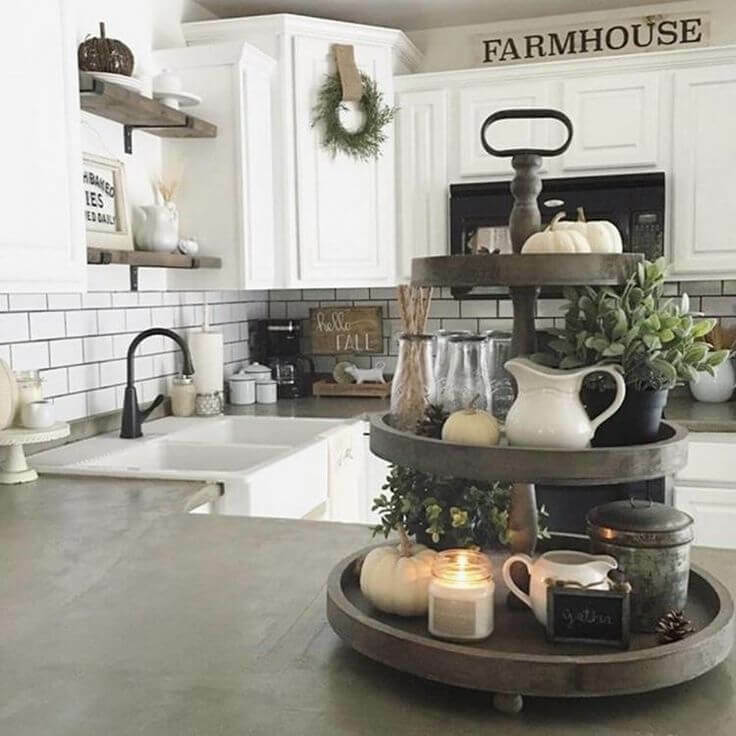 Here, in a kitchen or dining room, mixing natural wood shelves with white porcelain storage and galvanized metal buckets as vases brings the farmhouse look. Vinyl on glass and chunky white letters are innovative ways to define the space. Fresh ideas for lighting in a dining room call for pretty lanterns like this. Use a battery powered candle for a safe option that also gives nice, soft light for romantic dinners. The basket allows seasonal changes: holly at Christmas, fresh daisies in the spring, and wildflowers in the summer. Geometric patterns are a modern way to decorate small spaces with interest. Mix chevron and quatrefoil prints with other more random patterns as long as they all stay within the same neutral color family. 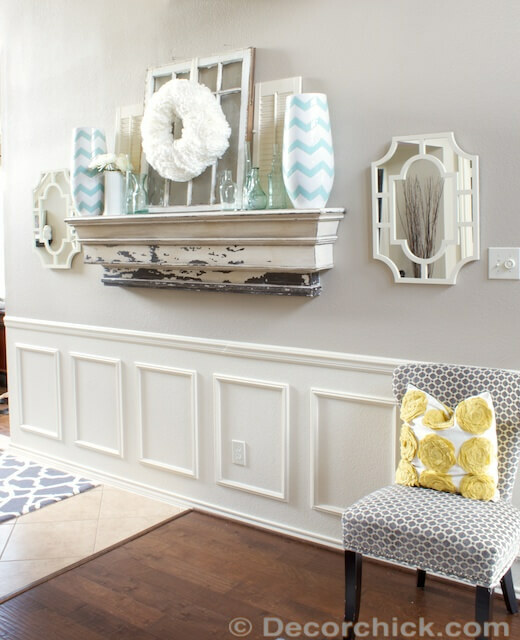 The distressed wood mantel and the molding and chair rail give a nice contrast, and the mirrors create the look of more space. 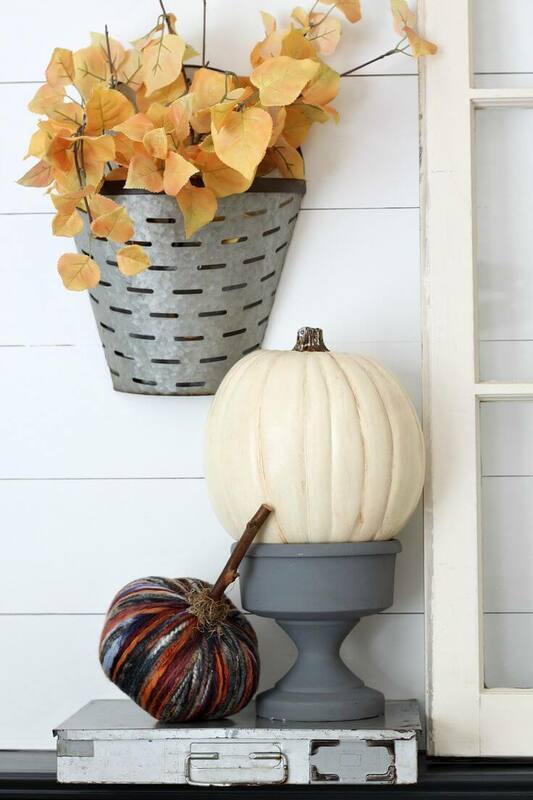 This white pumpkin on a painted grey pedestal makes a bold, pretty statement on a front porch. Wide white board siding makes a great backdrop. The galvanized planter on the wall is great to change out seasonally, and the flat wide box makes a great platform to give the space different height and dimension. Shiplap walls, antique furniture, a wire bedframe, and low chairs are the perfect setting for a steamer trunk turned coffee table. It serves as a flat surface and storage for blankets or books. Light pine floors give an airy feel that goes well with the white linen curtains. 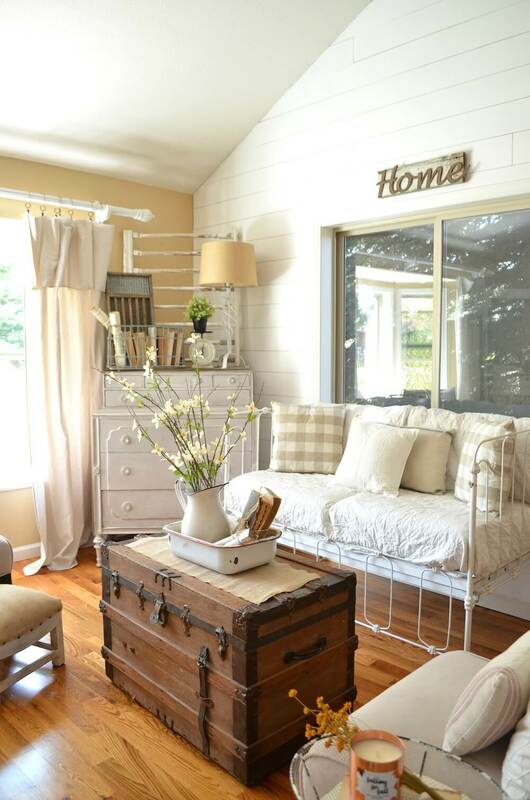 Bring a combination of solid and patterned pillows to finish off the farmhouse look. 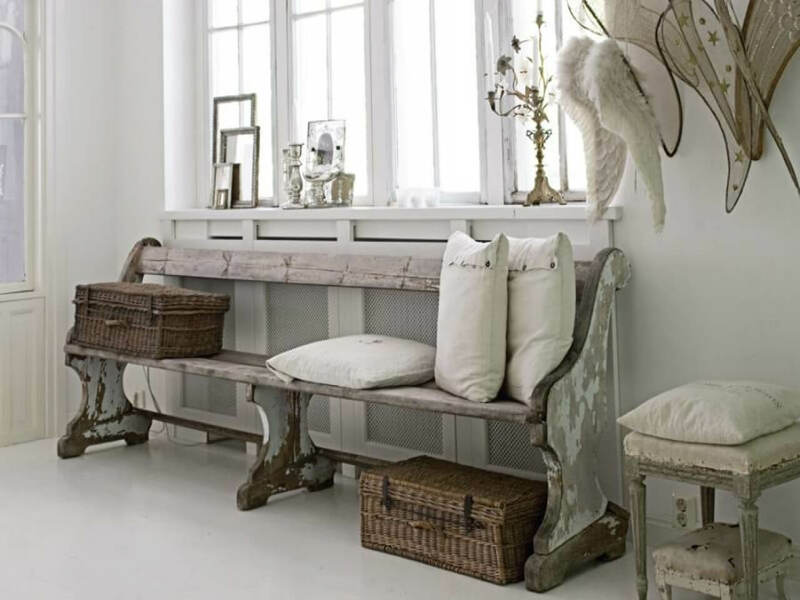 Church pews are the quintessential country farmhouse pieces. They make the perfect place to sit and put on shoes or even as extra seating in a dining room. Sitting on this bench, holding a plate of hors d’oeuvres and chatting with a friend at a dinner party is the ultimate farmhouse picture. Add pillows for comfort and baskets for storage, and set it in front of a pretty window that dressed, and you have a great entryway. You can’t drive down a country road without seeing a topiary flanking a front door. Bringing them inside is such a fresh, new idea! Complimenting the height of the plants with tall baluster candlesticks and a large antique window makes a beautiful wall in a living room. The antique shutters are farmhouse accents that never look bad.